Imagine an NFL team with a QB who throws for 4,000 yards, a running back who reaches the 1,000-yard mark for the season, and two (not one, but two) receivers who gain 1,000 or more yards in the same season. That would be a pretty impressive offensive unit. The 2014 Green Bay Packers were the only team to have four players reach these milestones together. Quarterback Aaron Rodgers had 4,381 yards passing; running back Eddie Lace gained 1,139 yards rushing for the season; and receivers Jordy Nelson and Randall Cobb each went over the 1,000-mark in receiving yards for the season. They became the 22nd team since 1966 to have a 1,000-yard running back, two 1,000-yard receivers and a 4,000-yard QB. For the Pack, it was the fifth time since ’66 that they had four players reach these numbers in a season, most in the NFL. Here are the Green Bay players who reached these milestones for the Packers in those five seasons. Following is a look at the teams that had a season with a QB with 4,000-plus passing yards, a running back with 1,000-plus rushing yards, and two receivers each with 1,000-plus receiving yards. Four of the above teams made it to the Super Bowl that season: St. Louis, 1999; St. Louis, 2001; Indianapolis, 2006; Denver, 2013. 1. 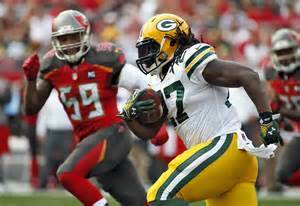 Running back Eddie Lacy is one of four players that have 700 yards rushing and 300 yards receiving after 12 games. 2. Randall Cobb and Jordy Nelson each have 10 TDs this season. The only other team to have two players with 10 or more TDs are the Denver Broncos (Demaryius Thomas and Julius Thomas). Eddie Lacy’s next TD will give him 10 for the season. 3. Aaron Rodgers is one of only two QBs this season with 25 or more sacks and a QB Rating over 100 (Rodgers has 25 sacks and a QBR of 118.6). The other QB? Ben Roethlisberger of the Steelers. 4. Through 12 games, the Packers have had the fewest number of offensive drives with 126. However, they have scored on the highest percentage of their drives, 48.4%. 5. Green Bay has scored nine TDs of 50 yards or more (six offensive TDs, two interceptions for TD and a punt return for TD). They have given up only two TDs of 50-plus yards… a kick-off return to the Bears and a 50-yard pass play to the Saints. 6. The Packers have had only one turnover since their bye week (Week #9). They have had no turnovers in the last three games. Until they played in the turnover-less game against the Patriots last week, the Packers had a takeaway in 11 straight games. 7. The Packers opponent tonight, the Atlanta Falcons, have 32 overall TDs this season. The Packers have 32 passing TDs of their 46 overall touchdowns. 8. Green Bay has punted only 39 times this season. The only team with fewer punts this season through 12 games were the Baltimore Ravens with 38. 9. The Packers defense is one of six teams in the NFL this year with three interceptions returned for TD. 10. The Pack have had only 6.3% of their offensive drives this season end with a turnover. Only the Seattle Seahawks have a lower percentage (5.4%). 11. Through 12 games, NFL placekickers have made 940 of 945 extra points (99.5%). Green Bay’s Mason Crosby is one of the five kickers to have a failed extra point. 12. While the Packers rank third in the league with 32 TD passes, they rank 23rd in the NFL with most pass attempts. 13. Green Bay ranks first in the league through 12 games in turnover ratio (takeaways/turnovers). The last seasons where the Packers led the league in this category were 2009, 2002 and 1965. 14. A great stat courtesy of ESPN: If the Packers win tonight against the Falcons in Aaron Rodgers’ 100th career start, Rodgers will have a 68-32 record in his first 100 starts. Former Packers QB Brett Favre was 68-32 in his first 100 starts. 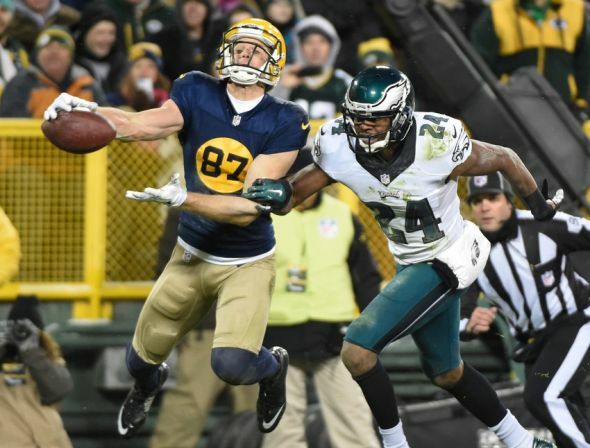 Following are some stats you may not know from the Packers 53-20 win over the Eagles. 1. Jordy Nelson had his fifth play for 50 yards or more in the contest. It was his fifth such play of the season. He is tied with DeSean Jackson and Jeremy Maclin for most plays of 50 yards or more this season. Since 2010, Nelson has had 10 such plays, tied for second in the NFL. 2. The Packers scored 10 or more points in the first quarter for the fifth time this year. They are 4-1 in such games. Since 2010, Green Bay is 18-3 when they score 10 or more points in the first quarter. 3. The Pack had a 30-6 lead at halftime in the game. They are now 20-0 since 1966 in games where they have a lead of 24 or more points at halftime. 4. Green Bay held the Eagles scoreless in the first quarter, the fourth time they have done so this season. The Packers have now won 14 of their last 15 when they hold their opponents scoreless in the first quarter. 5. Dom Capers defense had three sacks in the game. They are 20-5-1 in games since 2011 when they have three or more sacks in a contest. 6. Green Bay scored 30 points in the first half. They are now 17-0 in games when they score 30-plus points in the first half (since 1966). 7. Jordy Nelson and Randall Cobb each had over 100 yards receiving in the game. It was the fourth time this pair has reached this milestone in a game together. For Cobb, he had 10 receptions, the 34th time a Packers receiver has had 10 or more catches in a game. 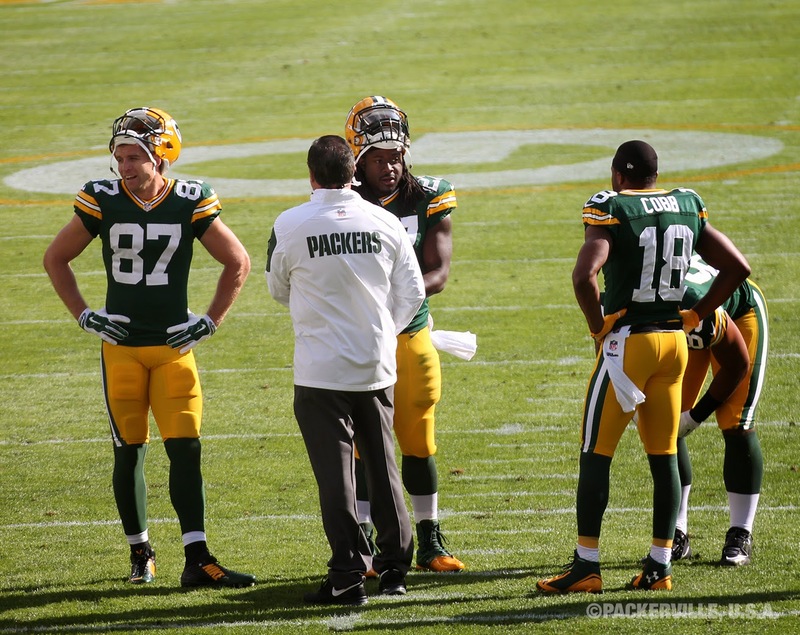 The Packers have won their last eight games where they have a receiver with 10 or more catches in a game. 8. The Packers 53 points keep them on a pace to break the all-time record for most points scored at Lambeau Field in a season. The record is 321 points (40.1 pts./game). 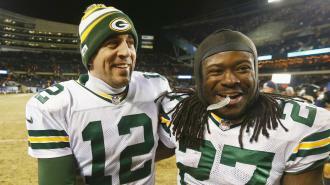 In the first five games at Lambeau this season the Packers have now scored 219 points (43.8 pts./game). They will need to score 103 points in the final three games (average 34.3) at home to break the record. 9. The Packers scored 50-plus points in consecutive games for the first time in franchise history. 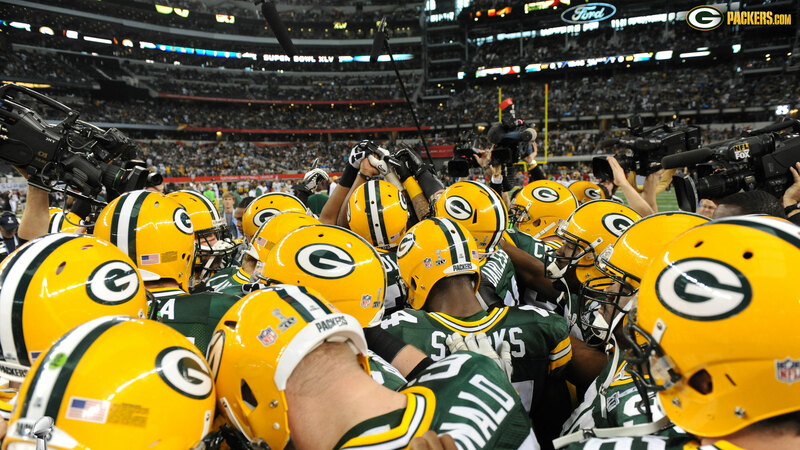 The Packers last scored 40-plus points in consecutive games in 2011 when they scored 45 in both Week #9 and Week #10. They have never scored over 40 points in three consecutive games. 10. Eddie Lacy had a rushing and receiving TD in yesterday’s game. He became the first player to have one of each since John Kuhn did it in 2010. He became the 22nd Packer to accomplish this feat. Ahman Green holds the record with nine games with at least one rushing and one pass receiving TD in the same game. 11. The 33-point victory was the fourth win by 30 or more points in a season, tying a team mark. The last time they won four games by a margin of 30 points or more in a season was 1996. If I’m not mistaken, something special happened at the end of that season… a Super Bowl win! 13. Rodgers has three TDs and over 300 yards passing in the contest. It was the 26th game of his career with three or more TD passes and 300 or more yards passing. He is seventh on the all-time list in this stat; Peyton Manning has had 51 games in his career with three-plus TD passes and 300-plus yards in the same contest. 14. The Packers had a fumble return for TD, an interception return for TD and a punt return for TD. It was the first time since 1983 when they scored by those three ways in the same game. It was in a game versus Tampa Bay. Trivia answer: The seven teams that Aaron Rodgers has not had a game with three or more TD passes are Buffalo, Cincinnati, Jacksonville, Kansas City, New England, Oaklad and Seattle.